The Short Version: When Marie Antoinette said, “Let them eat cake,” it may have been because she was hogging all the Michel et Augustin cookies for herself. Childhood mates Michel and Augustin met in middle school, and, when they found their adult 9-to-5 jobs to be unfulfilling, they started a cookie company with a foundation in French pastry. Fast forward 13 years, and the two friends have offices in France and New York and are seducing the world with their cookies, pastries, yogurts, mousses, and other desserts made with simple, pronounceable ingredients. The duo also teaches aspiring bakers that mastering the art of French pastry is attainable through their cookbooks and interactive open house classes. Michel and Augustin’s dream is simple: to make the world smile and come together over a shared love of sweets. The story of Michel et Augustin started simply enough. Two boys began palling around in middle school and became good buddies. But, as with many adolescent friendships, the two parted ways after graduation to follow their own paths. Michel found himself working in finance in New York, and Augustin was working in marketing for Air France. But both soon became disillusioned with the 9-to-5 grind of the business world. They reconnected and the duo devised a wild plan to discover all 1,263 bakeries in France and develop a guide to the best confectioneries the country had to offer. They wrote a book about it — their first collaboration! Michel and Augustin are dedicated to producing tasty treats from recipes based in French pastry. After completing their quest, in 2004, Michel and Augustin aproned-up and set out on a new adventure: baking in Augustin’s kitchen. Their mission was to create a line of cookies and other desserts made with natural ingredients and love. And, after tirelessly testing and tasting more than 300 recipes, their first concoction was born: the little round butter cookie. Michel et Augustin was born! The pair found quick success, and they continue to innovate more delicious creations, such as a decadent yogurt in a bottle, which was discovered only once Michel and Augustin realized their prized cow could produce more than butter. They market their products with the trademark “kookiness” and the joy they infuse into their tasty treats. 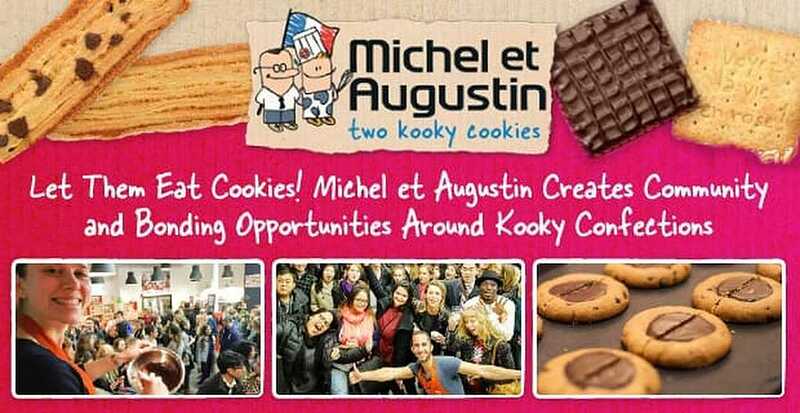 Michel et Augustin is about more than just making a delicious cookie. The company is bent on drawing from France’s rich culinary history to create masterful desserts. But Lily told us an affinity for and mastery of French pastry isn’t just reserved for the product developers (they call them the “recipe team”) at Michel et Augustin. Part of the company’s kooky culture is sharing the passion and expertise of pastry making so every member of the team, in France and Brooklyn, can train to be a French pastry chef and take the national exam (known as a “C.A.P.”). This way, everyone can participate in innovating new recipes and speak knowledgeably with fans, clients, and consumers. Though Michel et Augustin offers a more expansive product line in France, the company sticks to the same fundamentals and principles of creation for all products. This results not only in a yummy decadence, but also a treat you can feel good about eating with your special someone. There’s just something about sharing sweets that starts the day right or ends a perfect date. And Michel et Augustin’s creations were meant for just such occasions. With so many worthy treats to choose from, there’s no need to pick just one. While there are many more options in France — from chocolate mousse to decadent yogurts and, of course, one-of-a-kind cookies — there are many options available in the US as well. Lily was quick to recommend the perfect treats to give to or enjoy with that special someone. For couples who really enjoy their morning ritual together, Lily told us Puff Palmiers are a lovely a.m. option. Whether you and your honey are chocoholics or appreciate the delicate butteriness of caramel (or everything in between), Michel et Augustin has a worthy treat for sharing (or sneaking off with for your own clandestine cookie affair). Michel et Augustin’s philosophy is that the joy of sweets is in the sharing. So it should be no surprise community engagement is a large part of the company’s business mission. Everyone is invited to stop in and chat (and taste cookies) at their Banana Farms (offices) in Paris, Lyon, or Brooklyn. This attitude started at the very beginning of the business and is part of its core. And Lily noted this philosophy is exemplified in the company’s open houses. Open house at the Banana Farm takes place on the first Thursday of every month in France and New York. Lily told us these events present a way for the company to give back to the community by teaching them about the history and methodologies of French pastry. Not only is it fun and tummy-pleasing to attend, but if you lack a cookie companion, just imagine all the other dessert aficionados you could meet at the Banana Farm. After all, if someone likes Michel et Augustin treats, you know they have good taste, and you’ll have something to bond over. In true Michel and Augustin form, the duo started a Random Acts of Kookiness initiative to inspire and delight the public. From a tribute to Michael Jackson to the cookie square event and their torrid Greek tale, Michel and Augustin infuse hilarity and joy into all they do. You can see why their goodies are so addicting — they’re made with natural ingredients and good vibes. Up next for the company is a new cookbook that aims to help US readers and others overcome the intimidation associated with French pastry. Michel et Augustin is also looking to launch its famous chocolate mousse in the US. And, after tasting the company’s cookies and other treats, the US is surely in for a long love affair with that mousse.